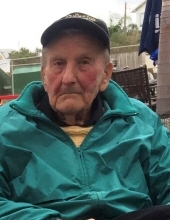 Russell Arnold “Popa” Holdrege, 92, of Bainbridge, NY, went to be with his Lord on the morning of November 13, 2018. He was born on June 23rd, 1926 in the town of Afton, NY, to parents Fred and Adeline Holdrege. As a young man, he grew up helping his father on the farm and later enlisted in the Army, serving honorably in the Pacific Theater during WWII as a member of the 158th RCT Bushmasters. In October of 1952, he married his wife, Georgia and enjoyed a 35 year career at Amphenol in Sidney, NY. He spent much of his retirement working at Scott’s Oquaga Lake House with his eldest son and his family. He is survived by his loving wife, Georgia Holdrege, son Gary and daughter in law Patty Holdrege, and son Greg Holdrege. He leaves behind his grandchildren Michael and his wife Ewelina Holdrege, Michelle and her husband David Hallock, Shelby and her husband CJ Brink, and Brandon Holdrege. He also leaves behind eight loving great grandchildren. To plant a tree in memory of Russell Arnold Holdrege, please visit our Tribute Store. "Email Address" would like to share the life celebration of Russell Arnold Holdrege. Click on the "link" to go to share a favorite memory or leave a condolence message for the family.